KL Rahul led the charge as India made light work of a paltry target of 106 to win the final Test by eight wickets and clinch the four-match series 2-1 to regain the Border-Gavaskar Trophy, as cricket finally took center stage in a series that was marred by controversies both on and off the field. The day belonged to debutant Kuldeep Yadav as India's 288th Test player and the country’s first Chinaman bowler in international cricket restricted Australia to just 300 with a four-wicket burst after skipper Virat Kohli was ruled out with a shoulder injury and stand-in skipper Ajinkya Rahane marshaled his men inspiringly. Rahane handed Kuldeep the ball in the 27th over to unsettle the Steve Smith-David Warner partnership and the youngster responded with a superb three-wicket burst in his opening spell to derail the visitors. Although Smith continued his rich vein of form against India, slamming his seventh hundred in eight Tests, the skipper failed to get sufficient support from the other end and Australia were bowled out before stumps in Dharamsala. 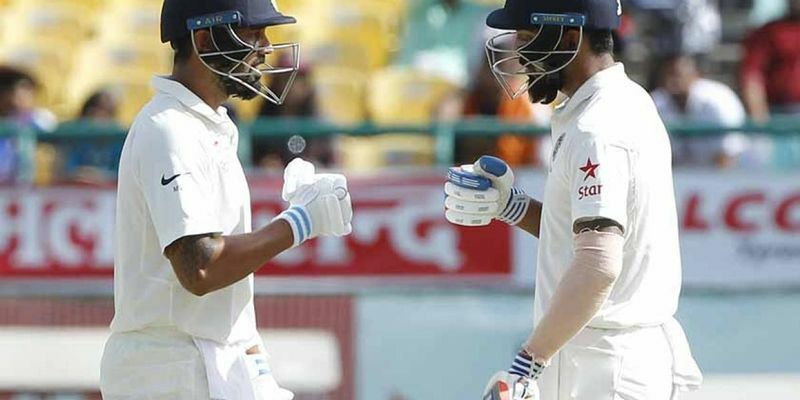 Much like Australia on the previous day, India lost momentum and slipped from a strong 108 for 1 to 221-6 before Wriddhiman Saha and Ravindra Jadeja guided the hosts to 248/6 at the close. Rahane showed signs of returning to form as he pulled fast bowler Pat Cummins for a boundary and top-edged him for a six before adopting the cautious approach against the spinners. India had moved to 153 for 2 at tea before off-spinner Nathan Lyon found some zip and bite on the pitch as he sent back Cheteshwar Pujara, who scored another fifty, Rahane, Karun Nair, and R Ashwin to bring Australia back into the game. At the close, India trailed the visitors by 52 with four wickets in hand. Jadeja completed a fifty as India took a crucial 32-run first lead and moved into a position of control in their bid to regain the Border-Gavaskar Trophy that they last held in 2013-14. The hosts were all out for 332 and then hit back to reduce Australia to 92-5 with the pacers sharing four wickets. While Umesh Yadav kept at his short-ball ploy, Bhuvneshwar Kumar got the big scalp of Smith for just 17, to mount the pressure on the visitors. Ashwin and Jadeja shared six wickets to bamboozled the Aussie lower half. Jadeja’s performance with the ball, following his heroics with the willow in the first innings, makes him a worthy contender for the man of the match award. Openers Murali Vijay and KL Rahul guided the hosts to 19 without loss at stumps. India’s strong performances over the first three days ensured that it was only a matter of time before they secured the Border-Gavaskar trophy. And, in the opening session of the fourth day’s play, Rahul made his intentions clear by hitting a few boundaries to help wrap it up early. The Karnataka batsman struck his sixth fifty of the series to underline his major role in India regaining the coveted trophy. Cummins removed Vijay with the score at 46 and Pujara was run out at the same total, before Rahul and Rahane closed the contest. Jadeja walked away with both Player of the match and Player of the series awards. It was India's fourth Test series win of the long home season.